← How to change PDF file's paper size? VeryPDF HTML5 PDF & Image Annotation is designed based on HTML5 technology and allows you to seamlessly add document annotation capability into your web pages. The module is 100% independent and can be used without any external dependencies and VeryPDF server calls. Once installed, you'll be able to easily embed HTML5 annotation UI into any page within your website. Users can then upload and annotate PDF and Microsoft Office documents online, right from the web page. Thanks to using HTML5 technology, uploaded documents are not rasterized, but converted to a combination of HTML, CSS and SVG. This allows the module to render PDF and Microsoft Office documents as real text files, meaning users can search for, select and copy text right from the documents embedded to a web page. This also allows users to mark up, strikeout and comment on selected text chunks when annotating a document. No Flash, Adobe Acrobat or any other client-side plugin installation required - the module works with any web-enabled device and browser that supports HTML5, including: Internet Explorer (8+), Firefox, Firefox for Android , Chrome, Chrome for Android, Opera, Opera Mini, Safari (5+), Mobile Safari. The module is 100% independent. Documents can be hosted using your own on-premise storage infrastructure and behind your firewalls. The module comes with a comprehensive set of annotation tools: users can highlight, strikeout and comment on text, add notes to any point in the document, comment on images, draw freehand lines and shapes, etc. With the real-time document annotation and mouse broadcasting feature, several users can review and annotate the same document simultaneously, each seeing others' notes in real time. 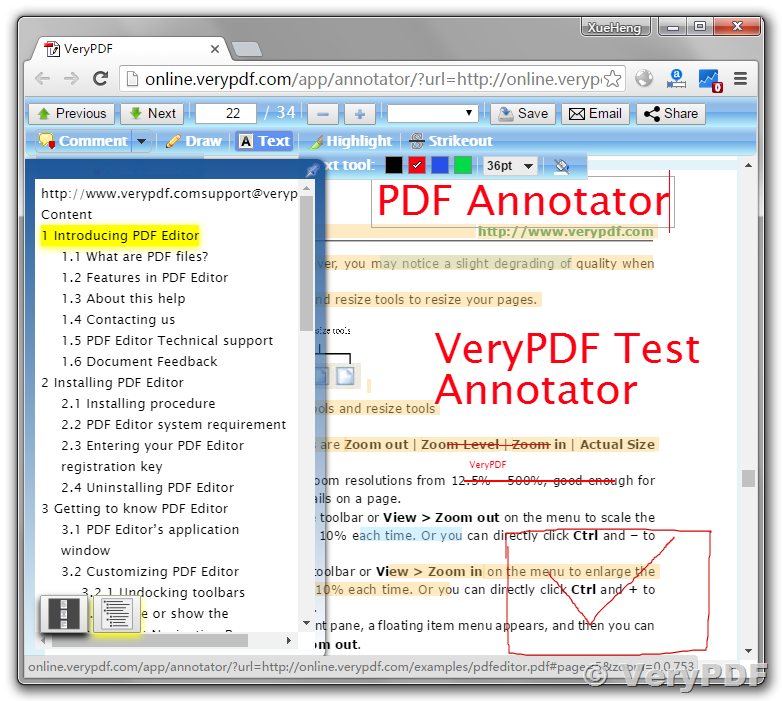 Annotated documents can be saved, printed and exported to a PDF file with all the added comments and markups. 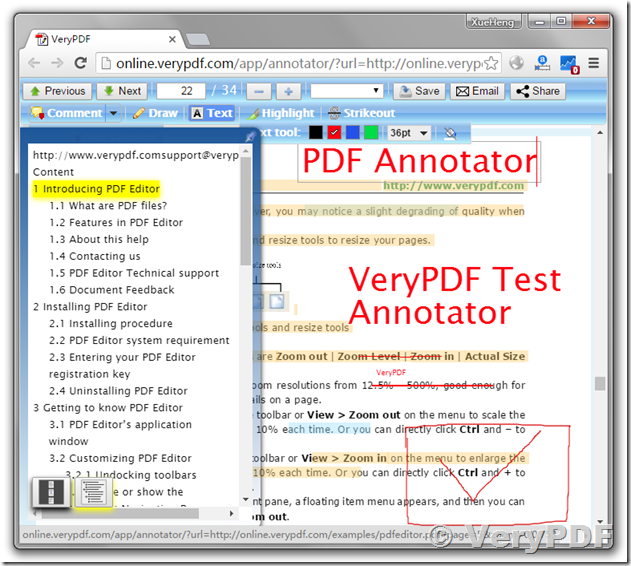 For more details on the VeryPDF' HTML5 PDF annotation library for .NET platforms, please visit our website. This entry was posted in VeryPDF Cloud API, VeryPDF SDK & COM and tagged pdf annotation, PDF annotator. Bookmark the permalink.